MATRIX AI Network (MAN) has announced that they are now available for trading and withdrawal on KuCoin exchange market at 20:00 May 15, 2018 (UTC+8). Supported trading pairs include MAN/BTC, MAN/ETH. 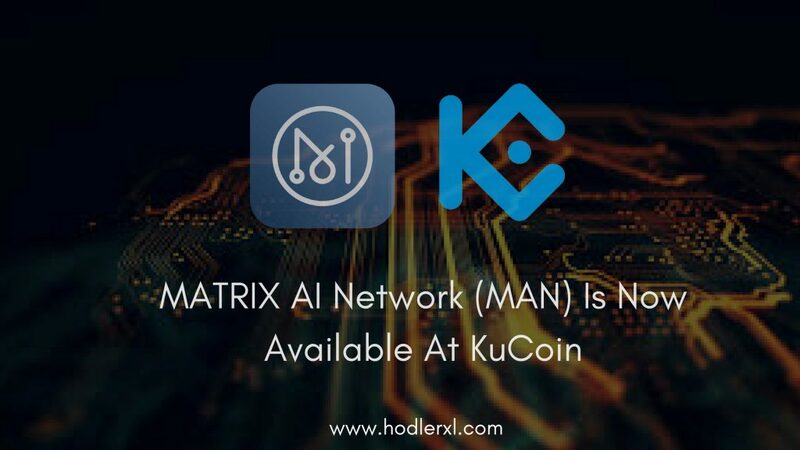 MATRIX AI Network (MAN) gets listed on KuCoin! MATRIX AI is an open-source blockchain that helps smart contracts and machine learning services. With its infrastructure developed with artificial intelligence (AI) techniques, MATRIX transforms the user experience of performing smart contracts by delivering the whole process faster, easier, and trustworthy. MATRIX offers innovative technologies in producing highly manageable blockchain networks, which promote adaptive self-optimization and multi-chain collaboration. As an expansion to refactoring the blockchain with AI, MATRIX also recognizes its mining power to be utilized AI-powered big data applications. A hybrid within POW (Proof of Work) and POS (Proof of Stake). Considering the principal Blockchain of MAN has not yet been created, they are taking advantage of the Ethereum Square network to begin their Tokens. Once achieved, the holders of MAN will be able to change 1:1 in the new blockchain of MATRIX. A newer environment through artificial intelligence in with which we can see in our smart watch the hours of sleep, calories used while walking or even to search in our refrigerator feeding points by applications that are based on the position of our body. Use its assistant to search the best way to work or adjust your driving with speed control. Active work meetings without pen or paper. Recognition of the MATRIX work assistant, work meetings can be automatically registered and assigned to the attendees’ mobile. Manage the security of your home, turn on or off the lights and shut the door. It even automatically requests for your preferred soda when entering a restaurant. These are small instances of the many applications that MATRIX AI Network will deliver to people’s daily lives in the future. Launched on September 15, 2017, KuCoin is a cryptocurrency exchange that utilizes KuCoin Shares (KCS) in a related way to Balance. User received a discount on transaction fees when it opted to use KuCoin tokens. Overall, KuCoin strives to be a more user-friendly exchange than conventional exchanges accessible today. The platform shares 90% of trading fees with users. They also have a 24/7 customer service and has generous referral rewards. KuCoin is also known for posting coin pairs before they hit other principal cryptocurrency exchanges. The website highlights a list of coins listed to be added to the platform in the coming days.